Pair of sconces in brass and satinized glass, attributed to Arredoluce Italy. Dimensions: height 12.6 in. (32 cm), depth 3.9 in. (10 cm) and width 1.6 inches (4 cm). Height of the glass 9.6 inches (24.5 cm). Socket: E17 (110 V) 14-17 mm, small Edison screw (SES). Alongside with companies like Arteluce and Stilnovo, Arredoluce was one of the manufacturers which changed the face of Italian lighting design in the 1950s. Over the years Arredoluce employed several famous designers like Gio Ponti, Ettore Sottsass and Angelo Lelli. The tape is not around the glass because it is broken. Only to get it easily in and out of the holder. It can get off, I left it as I found it. The wire is in a good but used condition. 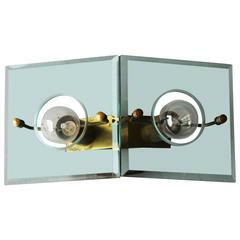 Four Italian wall lights attibuted to Stilnovo. Pair of brass and opaline sunburst sconces. Possibility of two other pairs. Pair of wall sconces, Attributed to Arredoluce, Italy, 1950. Brass arms, E 14 bulb sockets, Rewired. 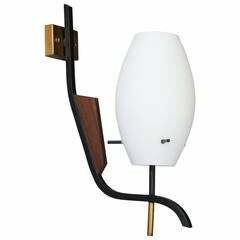 This pair of sconces was produced by Arredoluce in Monza, Italy. 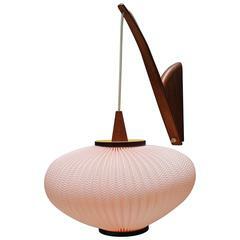 They are made from opaline glass, brass and lacquered metal. They are in very good vintage condition.